Copper Gutter Installation in Sacramento – Call For Your Estimate Today! If you are interested in learning more about the costs of copper gutter and installation of custom-made copper gutters for your home. Cleaning Sacramento Gutter is committed to bringing you a complete product that will last you for decades to come. Cleaning Sacramento Gutters offers competitive pricing throughout the Sacramento, CA region. If you have any questions or are interested in a consultation give us a call today and will be happy to help. The copper gutter is our premier gutter for the Sacramento Region. The copper gutter can give your home that vintage look that you always wanted while providing your home with the type of gutter that your home needs in order to protect your home from future problems. 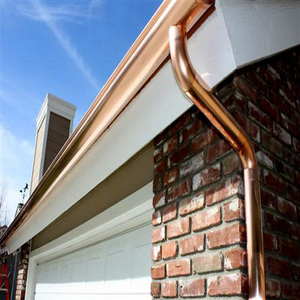 In the Sacramento region copper gutter is one of the most sought-after types of gutter, because of the fact that copper gutter is a stronger type of gutter that brings the shine out of your home, as well as equipping your home with a finished product that can last up to 100 years. When copper gutter is installed properly it can be one of the most helpful ways to maintain the longevity of your home, helping avoid dry rot and leaks for years to come. Gutters for your home in Sacramento, when installed properly, is one of the most helpful ways to maintain the longevity of your Sacramento home, and with the amount you have invested, it is always on your radar if anything needs to be fixed. One of the most effective investments you can make for your home is changing your old gutters for copper gutters. If you are looking for a strong durable type of gutter, and want to have a classy style that will last for years to come, a copper gutter is what you are looking for in Sacramento. We offer a vast amount of different types of styles that are seamless and custom to your home. The styles that we offer include European half round copper rain gutter, radius copper rain gutters, K Style (OGEE) copper rain gutter. There are many reasons why people choose copper gutter for their home in Sacramento. The style and look of copper gutter on your home bars none in comparison to the other types of gutters that are available for you to choose. Since some are seamless you will never have to worry about seams nor will you have to worry about leaks, because copper gutter is not caulked but it is soldered together making it impenetrable for far longer. Another reason why Sacramento's copper gutters are so sought after is due to the fact that it is proven to withstand harsher weathers, and is naturally resistant to corrosion. Copper gutter will never have issues when it comes to other materials. Lastly, One of the most appealing reasons why people choose copper gutter for their home is because the average lifespan of copper gutter ranges from 60 to 100 years which makes it going copper a great investment. When properly maintained, the copper gutter can last the entire span of your homes life, especially for Sacramento residents. A quality installation can remain virtually maintenance requiring no painting, sanding or other surface treatments required by other materials. We pride ourselves on our quality of work and our installers are highly trained spending thousands of hours perfecting their craft to make sure that we install, and complete a high-quality product for your Sacramento, Ca home. 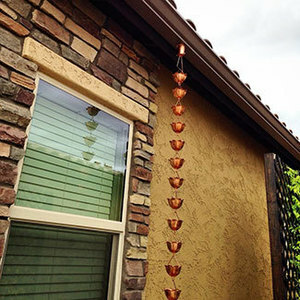 Installing Copper gutter is not an easy task to take on, so we highly advise you should not attempt to install copper rain gutter if you are just starting in the industry, or plan on doing it yourself. It takes years of experience with extensive knowledge of how to install gutter properly to be able to install copper gutter. Since Copper gutter is custom we fabricate it on site using a seamless gutter machine. The gutter machine molds and forms the copper gutter, creating a beautiful seamless gutter custom to your home. Why Copper Gutter Installation Sacramento? Thinking about a copper gutter installation in Sacramento? The gutter system that you choose can have a large impact on the appearance and value of your home. The materials you decide on will determine how often you have to clean out your gutter system, how long they are going to last and how much maintenance is required. Most homes today are fitted with a standard aluminum gutter system because they are cost-effective, easy to install and do what they are supposed to. But many homeowners are finding that gutter systems can also be seen as an aesthetic feature to the home. 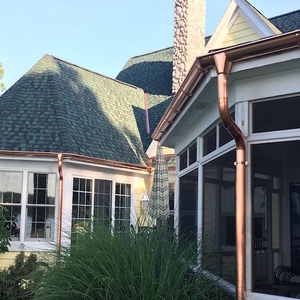 Copper gutters add a beauty that standard aluminum gutters simply do not. If you have been thinking about a copper gutter installation in Sacramento call Monster's Gutters. A copper gutter installation adds curb appeal. Copper gutters are not commonly chosen, so your home could be the only one on the block with a copper gutter system. It adds elegance and value to your home. As well as increasing your property value. With a copper gutter installation, you will have two choices depending on what style you decide to go with. One is called a patina and takes several years to accomplish. If copper gutters are left untreated you will get this rustic beautiful look after several years. If you prefer the natural new copper look, they will need to be treated with a sealant to prevent the oxidation process. A copper gutter installation will last a lot longer. Copper has been a material used in roofing since through the ages and has withstood the test of time. Copper does not rust and is a strong and durable metal. A copper gutter installation in Sacramento will last for the entire life of your home. We promise that it will be the last gutter system you will ever need. Most other gutter systems are made of materials that will rust away in just a matter of years. Copper is resistant to corrosion in and variety of weather and environment. Unlike gutters made of other materials, copper gutters can withstand extreme temperature variations. With a copper gutter installation in Sacramento there will be little to no maintenance. Copper is also a fungicide and algaecide, this prevents things like moss from growing in your system and causing blockages. This will assure minimal cleaning. As homeowners, we are all faced with decisions that will add your own personal touch to your property. Having a new copper gutter installation in Sacramento will provide your home with the beauty you didn't know it was missing all these years. You will discover that by making the choice to have copper gutters installed you will have increased your home value and saved a ton of money on the maintenance/repairs/replacements that come with any other type of gutter system out there. We fabricate all of our copper gutter on site. This allows us to install a copper gutter system custom to your home. Copper gutter has to be handled gently and meticulously using gloves so that way the oils on our fingers do not stain the copper gutter. once we are complete with installing the gutter we solder the end caps and add the downspouts. It sounds easier said than done. Installation of a copper gutter is not an easy task to take on and is not the cheapest type of gutter out there, so we highly advise that you should not attempt to install copper rain gutter if you are just starting in the industry, or plan on doing it yourself. It takes years of experience with extensive knowledge to have the know how to install gutter properly in order to correctly install a copper gutter on ones home. The simplest mistake can cause you to have the most problems such as not soldering it correctly which not only causes leaks but also cause for a damaged product. Handling of such gutter needs to be handled delicately because one mistake can cause for the whole installation to be off or worse ruined. In order for us to make the perfect install we first take exact measurements of your roof. We take in account for miters and placement of the downspouts. once complete your home will brandish a beautiful seamless gutter system that will have your neighbors, friends, and family in awe for years to come. Why Monsters Gutter for Copper Gutter? If you are interested in learning more about the costs of copper gutter and installation of custom-made copper gutters for your home give us a call today. Monsters Gutter Sacramento is committed to bringing you a complete product that will last you for decades to come. Monsters Gutter Sacramento offers competitive pricing throughout the Sacramento, CA region. If you have any questions or are interested in a consultation give us a call today and will be happy to help.